A gold coin pendant is made by means of fitting authentic precious metal coins into a pendant mount using various techniques intended to preserve the original state of the coin as much as possible. However, it’s clear that as soon as a gold coin pendant is made, the actual coin loses its numismatic value and can no longer hold its value in the true gold coin market. In addition, if you actually start regularly wearing such gold coin pendant, especially if it’s made from 24 karat content, these will be subject to considerable surface damage due to wear and tear and can lose even more value with time. 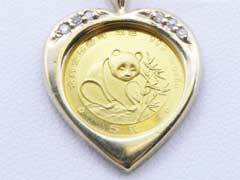 Coins fitted in necklaces or pendants could be classified as gold jewelry. While initially it might seem like a good idea to buy jewelry as means of investing, it’s not always the case. The price of precious metal jewelry carries a great deal of mark ups going beyond dealer fees you would normally pay to purchase a bullion coin or bar. These additional fees include middle men charges, overhead and various costs associated with labor and material that go into jewelry making. If you compare the end price with the actual precious metal content, you will realize that you might be paying way too much for you investment. While most numismatists do not seriously think twice about investing in any type of gold coin jewelry, however, there are some individuals who find such jewelry in form of gold pendants or gold coin rings to be very aesthetically appealing and worth every penny invested. American gold Eagle coin is perhaps one of the most popular gold coin pendant designs to add to your coin jewelry collection or simply to adorn your favorite dress with. Such jewelry is highly in fashion and you can spot quite a few celebrities nowadays sporting such pendants. It’s highly doubtful that gold coin jewelry is a sound investment; perhaps the best way to profit from the strong market price of gold is considering buying physical gold in form of bullion coins and bars from reputable sources with high customer ratings.